A delicious vegetarian treat with the meatiness of roasted aubergines and the tang of Pronto Mama Aubergine Slow-Roasted Tomatoes. Mix together the olive oil with a little salt and pepper. Brush the baguette slices with the olive oil and grill on a griddle pan until grill marks show and the bread is toasted. Repeat this process on the other side. Slice the aubergine into thin strips and place in the remaining olive oil mix. Grill the aubergine on the griddle pan until cooked through and place back into the olive oil. 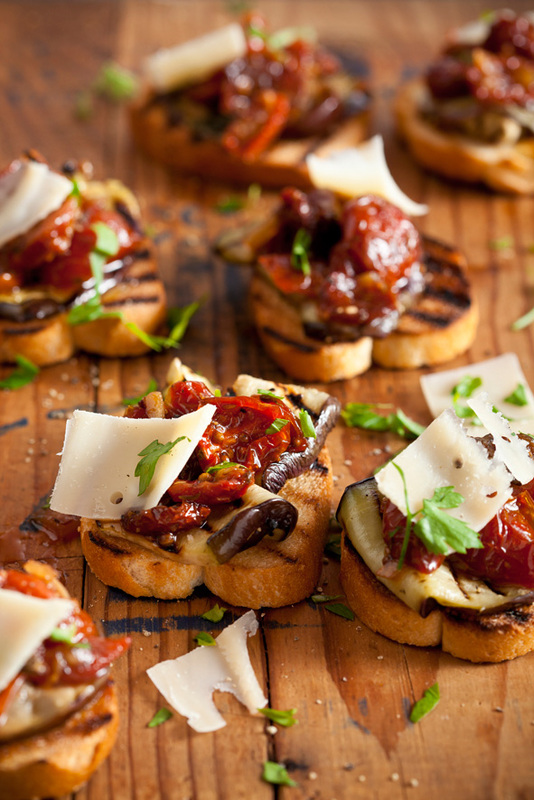 Top the bruschetta with a slice of grilled aubergine a generous tablespoon of pronto mamma and a few shavings of Parmesan. Season with salt and pepper and garnish with fresh sprigs of parsley. Serve immediately.